Copyright © 2000 by Gary A. David. To watch Orion ascend from the eastern horizon and assume its dominant winter position at the meridian is a wondrous spectacle. Even more so, it is a startling epiphany to see this constellation rise out of the red dust of the high desert as a stellar configuration of Anasazi cities built from the mid-eleventh to the end of the thirteenth century. The sky looks downward to find its image made manifest in the earth; the earth gazes upward, reflecting upon the unification of terrestrial and celestial. Extending from the giant hand of Arizonas Black Mesa that juts down from the northeast, three great fingers of rock beckon. They are the three Hopi Mesas, isolated upon this desolate but starkly beautiful landscape to which the Ancient Ones so long ago were led. Directing our attention to this Center of the World, we clearly see the close correlation to Orion’s Belt. Mintaka, a double star and the first of the trinity to peek over the eastern horizon as the constellation rises, corresponds to Oraibi and Hotevilla on Third (West) Mesa. The former village is considered the oldest continuously inhabited community on the continent, founded in the early twelfth century. As recently as 1906, the construction of the latter village proved to be a prophetic, albeit traumatic event in Hopi history precipitated by a split between the Progressives and the Traditionalists. About seven miles to the east, located at the base of Second (Middle) Mesa, Old Shungopovi (initially known as Masipa) is reputed to be the first village established after the Bear Clan migrated into the region circa A.D. 1100. Its celestial correlative is Alnilam, the middle star of the Belt. About seven miles farther east on First (East) Mesa, the adjacent villages of Walpi, Sichomovi, and Hano (Tewa) --the first of which was settled prior A.D. 1300-- correspond to the triple star Alnitak, rising last of the three stars of the Belt. Nearly due north of Oraibi at a distance of just over fifty-six miles is Betatakin ruin in Tsegi Canyon, while about four miles beyond is Kiet Siel ruin. Located in Navaho National Monument, both of these spectacular cliff dwellings were built during the mid-thirteenth century. Their sidereal counterpart is the double star Rigel, the left foot or knee of Orion. (We are conceptualizing Orion as viewed from the front.) Due south of Oraibi about fifty-six miles is Homol’ovi Ruins State Park, a group of four Anasazi ruins constructed between the mid-thirteenth and early fourteenth centuries. These represent the irregularly variable star Betelgeuse, the right shoulder of Orion. Almost forty-seven miles southwest of Oraibi is the primary Sinagua ruin of Wupatki National Monument, surrounded by a few smaller ruins. (“Sinagua” is the archaeological term for a group culturally similar and contemporaneous to the Anasazi.) Built in the early twelfth century, their celestial counterpart is Bellatrix, a slightly variable star forming the left shoulder of Orion. About fifty miles northeast of Walpi is the mouth of Canyon de Chelly National Monument. In this and its side Canyon del Muerto a number of Anasazi ruins dating from the mid-eleventh century are found. Saiph, the triple star forming the right foot or knee of Orion, corresponds to these ruins, primarily White House, Antelope House, and Mummy Cave. Extending northwest from Wupatki/Bellatrix, Orion’s left arm holds a shield over numerous smaller ruins in Grand Canyon National Park, including Tusayan near Desert View on the south rim. Extending southward from Homol’ovi/Betelgeuse, Orion’s right arm holds a nodule club above his head. This club stretches across the Mogollon Rim and down to other Sinagua ruins in the Verde Valley. As a small triangle formed by Meissa at its apex and by Phi 1 and Phi 2 Orionis at its base, the head of Orion correlates to the Sinagua ruins at Walnut Canyon National Monument and a few smaller ruins in the immediate region. This variation could be due either to cartographic distortions of the contemporary sky chart in relation to the geographic map or to ancient misperceptions of the proportions of the constellation vis-à-vis the landscape. Given the physical exigencies for building a village, such as springs or rivers, which are not prevalent in the desert anyway, this is a striking correlation, despite these small anomalies in the overall pattern. As John Grigsby says in his discussion of the relationship between the temples of Angkor in Cambodia and the constellation Draco, If this is a fluke then its an amazing one.... There is allowance for human error in the transference of the constellation on to a map, and then the transference of the fallible map on to a difficult terrain over hundreds of square kilometers with no method of checking the progress of the site from the air.1. In this case we are dealing not with Hindu/Buddhist temples but with multiple star cities sometimes separated from each other by more than fifty miles. Furthermore, we have suggested that the map is actually represented on a number of stone tablets given to the Hopi at the beginning of their migrations, and that this geodetic configuration was influenced or even specifically determined by a divine presence, viz., Masauu, god of earth and death. The closest correlation is between the left and right shoulders (BC and DE respectively) of the terrestrial and celestial Orions, with only about two degrees difference between the two pairs of angles. In addition, the left and right legs (AG and FG respectively) are within the limits of recognizable correspondence, with approximately six to eight degrees difference. The only angles that vary considerably are those that represent Orion's head (CD), with over fifteen degrees difference between terra firma and the firmament. Given the whole polygonal configuration, however, this discrepancy is not enough rule out a generally close correspondence between Orion Above and Orion Below. Another factor that precludes mere chance in this mirroring of sky and earth is the angular positioning of the terrestrial Orion in relation to longitude. According to their cosmology, the Hopi place importance on intercardinal (i.e., northwest, southwest, southeast, and northeast) rather than cardinal directions. Of course, the Anasazi could not make use of the compass but instead relied upon solstice sunrise and sunset points on the horizon for orientation. The Sun Chiefs (in Hopi, tawa-mongwi) still perform their observations of the eastern horizon at sunrise from the winter solstice on December 22 (azimuth 120 degrees) through the summer solstice on June 21 (azimuth 60 degrees), when the sun god Tawa is making his northward journey. On the other hand, they study the western horizon at sunset from June 21 (azimuth 300 degrees ) through December 22 (azimuth 240 degrees), when he travels south from the vicinity of the Sipapuni (located on the Little Colorado River just over four miles upstream from its confluence with the Colorado River) to the San Francisco Peaks in the southwest.2. A few days before and after each solstice Tawa seems to stop (the term solstice literally meaning the sun to stand still) and rest in his winter or summer Tawaki, or house. In fact, the winter Soyal ceremony is performed in part to encourage the sun to reverse his direction and return to Hopiland instead of continuing south and eventually disappearing altogether. At any rate, the key solstice points on the horizon that we designate by the azimuthal degrees of 60, 120, 240, and 300 (that is, at this specific latitude) recur in the relative positioning of the Anasazi sky cities. For instance, if we stand on the edge of Third Mesa near the village of Oraibi on the winter solstice, we can watch the sun set exactly at 240 degrees on the horizon, directly in line with the ruins of Wupatki almost fifty miles away. The sun disappears over Humphreys Peak, the highest mountain in Arizona where is located the major shrine of the katsinam (also spelled kachinas, beneficent supernatural beings who act as spiritual messengers). Incidentally, if this line between Oraibi and the San Francisco Peaks is extended southwest, it intersects the small pueblo called Kings Ruin in Big Chino Valley, a stop-off point on the major trade route from the Colorado River.3. (See Diagram 2.) If the line is extended farther southwest, it intersects the mouth of Bill Williams River on the Colorado. Conversely, if we stand at Wupatki on the summer solstice, we can see the sun rise directly over Oraibi on Third Mesa at 60 degrees on the horizon. On that same day the sun would set at 300 degrees, to which the left arm of the terrestrial Orion points. In addition, from Oraibi the summer solstice sun sets at 300 degrees, twelve degrees north of the Sipapuni on the Little Colorado River, the Place of Emergence of the Hopi from the Third to the Fourth Worlds. After going east, if we were to perch on the edge of Canyon de Chelly and not look downward into the canyon but instead southwest at the winter solstice sunset, the sun on the horizon would appear about five degrees south of the First Mesa Village of Walpi. If this line were extended farther southwest beyond the horizon, it would intersect both Sunset Crater and Humphreys Peak. Again, the reciprocal angular relationship between the two pueblo sites remains, so from Walpi at summer solstice sunrise the sun would appear to rise from Canyon de Chelly fifty miles away. A northeastward extension of this 65 degree line would eventually reach a point in New Mexico near Salmon Ruin and Aztec Ruin.4. In addition, a winter solstice sunrise line (120 degrees) drawn from Walpi past Wide Ruin traverses the Zuni Pueblo (a tribe closely related to the Hopi) and ends just south of El Morro National Monument.5. Standing during winter solstice sunrise on the edge of Tsegi Canyon where Betatakin and Keet Seel ruins are located, we could look southeast along the edge of Black Mesa and watch the sun come up over Canyon de Chelly and Canyon del Muerto. In fact, the sun would be at 120 degrees on the horizon directly over Antelope House Ruin in the latter canyon. An extension of the same line into New Mexico would intersect Casamero Ruin.6. Later on that first day of winter from the same spot at Tsegi Canyon we could see the sun set at 240 degrees azimuth over the Grand Canyon more than eighty miles to the southwest. From Tsegi a summer solstice sunrise line of 60 degrees would intersect Hovenweep National Monument in southeastern Utah, well known for the archaeoastronomical precision of its solstice and equinox markers. Again from Tsegi a sunset line of 300 degrees would cross Bryce Canyon National Park and Paunsaugunt Plateau, where nearly one hundred and fifty small Anasazi and Fremont ruins have been identified.7. If we travel one hundred and twelve miles almost due south of Tsegi Canyon to Homolovi, the summer solstice sunset would appear eight degrees south of Wupatki, which is fifty miles northwest of where we are standing. This line (designated as H in Diagram 1) running between Homolovi and Wupatki passes between Grand Falls, an impressive cataract along the Little Colorado River, and Roden Crater, a volcanic cinder cone that artist James Turrell has turned into an immense earth sculpture, to finally end at Tusayan Ruin on the south rim of the Grand Canyon. Again, from the reciprocal village of Wupatki the winter solstice sun would rise just north of Homolovi, which is at 128 azimuthal degrees in relation to the former site. This Wupatki-Homolovi line extended southeast would pass just south of Casa Malpais Ruin and end less than ten miles south of Gila Cliff Dwellings.8. From Homolovi a winter solstice sunrise line (120 degrees) would pass seven degrees north of Casa Malpais 9. and three degrees north of Raven Site Ruin 10., both north of the town of Springerville. From Homolovi at winter solstice sundown (240 degrees), the sun passes directly through East and West Sunset Mountains, the gateway to the Mogollon rim. This line from Homolovi proceeds past the early fourteenth century, thousand-room Chavez Pass Ruin on Anderson Mesa (in Hopi, Nuvakwewtaqa, mesa wearing a snow belt) 11. and continues along the Palatkwapi Trail down to the Verde Valley, ending near Clear Creek Ruin. If we extend the summer solstice sunrise line (60 degrees) from Homolovi into New Mexico, we intersect the vicinity of Chaco Canyon, perhaps the jewel of all the Anasazi sites in the Southwest. In this astral-terrestrial pattern Chaco corresponds to Sirius, the brightest star in the heavens located in Canis Major. Thus, in this schema each village is connected to at least one other by a solstice sunrise or sunset point on the horizon. This interrelationship provided a psychological link between ones own village and the people in ones sister village miles away. Moreover, it reinforced the divinely ordered coördinates of the various sky cities come down to earth. Not only did Masauu/Orion speak in a geodetic language that connected the Above with the Below, but also Tawa verified this configuration by his solar measurements along the curving rim of the tutskwa, or sacred earth. In addition to the solstice alignments, a number of intriguing non-solstice lines exists to corroborate the pattern as a whole. As heretofore stated, an extension of the solstice line between Oraibi and Wupatki (the Belt and left shoulder of the terrestrial Orion respectively) would ultimately end on the Colorado River at the point where a major trail east toward Anasazi territory began. Similarly, if the non-solstice line between Walpi and Homolovi (the Belt and the right shoulder respectively) were extended, it would intersect the wrist of the constellation and terminate within five miles of the important Hohokam ruin site and astronomical observatory of Casa Grande Ruins National Monument, near the Gila River one hundred and fifty miles away. We have also already discussed the extension of the Walpi-Canyon de Chelly solstice line (Orions right leg) ending up at the Salmon-Aztec ruin area. An extension of the Oraibi-Betatakin non-solstice line (Orions left leg) would bring us to Glen Canyon National Recreation Area. Ruefully, hundreds or perhaps even thousands of small Anasazi ruins were submerged by the construction of the Glen Canyon Dam in 1963, and the few that remain can only be reached by boat. Another alignment of ancient pueblo sites forms the grand chakra system of Orion and indicates the direction of the flow of spiritual energy. Drawing a line southwest from Shungopovi/Alnilam, we pass less than five miles southeast of Roden Crater and Grand Falls, both mentioned above. Continuing southwest the line runs by Ridge Ruin 12., through Winona Village 13., and into the forehead of Orion, viz., Walnut Canyon National Monument, a significant mid-twelfth century Sinagua ruin located in the foothills of the San Francisco Peaks. If the line is extended farther still, it intersects the red rock country of Sedona with its electromagnetic vortices, passing the small but gorgeously located ruin and pictograph site of Palatki, Red House, as well as the larger Honanki, Bear House. In the Verde Valley the newly energized vector directly transits Tuzigoot National Monument, a major thirteenth century Sinagua ruin of over one hundred rooms perched on a hilltop for the probable purpose of stellar observation. The line traverses the Black Hills of Arizona, goes by the newly excavated Emilienne Ruin 14. in Lonesome Valley, intersects the Fitzmaurice Ruin 15. located upon a ridge on the south bank of Lynx Creek in Prescott Valley, continues through the small Lynx Creek Ruin at the northern base of the Bradshaw Mountains, treks across the northern limits of the Sonoran desert, and passes near the geoglyphs 16. in Arizona and California to ultimately reach a point just north of the mouth of the Colorado River, perhaps the place where the ancients migrating on reed rafts from the Third World to the Fourth entered the territory. If we were to extend this line in the other direction from Shungopovi, it would travel northeast across Black Mesa, passing just southeast of Four Corners to finally end up at the major Anasazi sites of Mesa Verde National Park in southwestern Colorado. 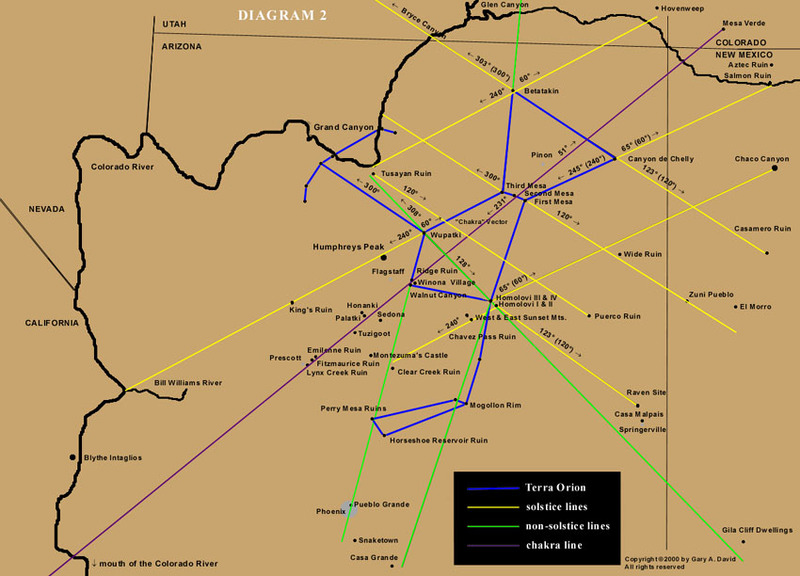 In this series of villages we have eleven both major and minor Anasazi or Sinagua ruins and one Hopi pueblo perfectly aligned over a distance of over 275 miles within the framework of the tellurian Orion. The probability that these are randomly distributed is highly unlikely and increases the possibility that Masauu (or some other agent perceived as being divine) directed their positioning. This “ley line” forms a grand chakra system which provides an inseparable link and a conduit of flowing pranic earth energy from the Hopi Mesas to the evergreens forests of the San Francisco Peaks. More specifically, Walnut Canyon symbolizes the Third Eye, or pineal gland (etymologically derived from the Latin word pinus, or “pine cone”), of Orion. At this point one might ask: Why is the template of Orion placed upon the earth at the specific angle relative to longitude that we find it? The chakra line mentioned above, which runs in part from Shungopovi/Alnilam (the Belt of Orion) to Walnut Canyon/Meissa (the head of Orion) is 231 degrees azimuth in relation to Shungopovi. The azimuthal direction of southwest is 225 degrees. Thus, the axis for the terrestrial Orion is within six degrees of northeast/southwest. If we stood at Shungopovi shortly after midnight nine centuries ago on the winter solstice and looked southwest, we would find the middle star of Orions Belt hovering directly above the southwest horizon at an altitude of about 38 degrees. Specifically, at 1:15 a.m. on December 22, A.D. 1100, Alnilam is at 231 degrees azimuth.17. In other words, gazing from the central star of the earthbound belt of Orion toward its head located in the foothills of the San Francisco Peaks where the katsinam live, we would see the celestial constellation precisely mirror the angle of the terrestrial configuration. One might also question the significance of this precise time when the middle star in Orions Belt is at 231 degrees. At the very moment we are watching this sidereal spectacle, one of the most sacred ceremonies 18. of the Hopi known as the Soyal is taking place in the subterranean chamber called a kiva. Just past its meridian Orion can be clearly seen through the hatchway. This is the time when Hotomkam [Orions Belt] begins to hang down in the sky. Now a powerful, barefooted figure descends the kiva ladder. He is painted with white dots which resemble stars on his arms, legs, chest, and back. He carries a crook on which is tied an ear of black corn, Masauus corn signifying the Above. One account identifies him as Muyingwa, the deity of germination related to the aforementioned Masauu.19. Another calls him Star man, ostensibly because of his headdress made of four white corn leaves representing a four-pointed star, perhaps Aldebaran in the Hyades.20. At any rate, this person takes a hoop covered with buckskin and begins to dance. His sun shield fringed with red horsehair is about a foot across with a dozen or so eagle feathers tied to its circumference. Its lower hemisphere is painted blue, its upper right quadrant is red, and its upper left quadrant is yellow. Two horizontal black lines for the eyes and a small downward pointing triangle for the mouth are painted on the lower half of this striking face of Tawa. Alexander Stephen, who witnessed the ritual at Walpi in 1891, remarked that the Star Priest stamps upon the sipapu (the hole in the floor of the kiva that links it to the Underworld) as a signal to start the most important portion of the ceremony.21. This occurs just after 1:00 a.m., the time on this date in the year A.D. 1100 (the approximate onset of settlement on the Hopi Mesas) when Orion was at 231 degrees azimuth. As the dance rhythm crescendos, the Star man begins to twirl the sun hoop very fast in clockwise rotation around the intercardinal points between two lines of Singers, one at the north and the other at the south. With mad oscillations (to quote A.M. Stephen) he is attempting to turn back the sun from its southward journey. All these dances, songs, and spinning of the sun are timed by the changing positions of the three stars, Hotomkam, overhead. Now is the time this must be done, before the sun rises and takes up his journey.22. If this were merely a solar ritual, one would assume that it would take place at sunrise. On the contrary, the sidereal position of Orion must reflect the terrestrial positioning of the constellation, which only occurs after the former has passed its meridian, i.e., ...when Hotomkam begins to hang down in the sky. Prior to dawn runners are sent out to the shrines of both Masauu (Orion) and Tawa (the sun) in order to deposit pahos (prayer feathers), offerings to the two gods whose complex interaction helps to assure the seasons cyclic return, keeping the world in balance for yet another year. It was Bauvals contention that the part of the Milky Way which interested the Egyptians most was the region that runs from the star Sirius along the constellation of Orion on up towards Taurus. This region of the sky seemed to correspond, in the Egyptian mind at least, to the area of the Memphite necropolis, that is to say the span of Old Kingdom burial grounds stretching along the west bank of the Nile from Dashur to Giza and down to Abu Ruwash. At the centre of this area was Giza; this, he determined, was the earthly equivalent of Rostau (Meads Rusta), the gateway to the Duat or underworld.24. The region in Hopi cosmology corresponding to the Rostau is called Tuuwanasavi (literally, center of the earth), located at the three Hopi Mesas. Similar to the ground-sky dualism of the three primary structures at the Giza necropolis, these natural "pyramids" closely reflect the Belt stars of Orion. In addition, the portal to the nether realms is known in Hopi as the Sipapuni, located in the Grand Canyon. This culturally sacrosanct area mirrors the left hand of Orion. Whereas the Egyptian Rostau is coextensive with the axis mundi of the Belt stars formed by the triad of pyramids, the Hopi gateway to the Underworld in the Grand Canyon is adjacent to the center place but still close enough to be archetypally resonant in that regard. Before me were two trails passing westward through the gap of the mountains. On the right was the rough narrow path, with the cactus and the coiled snakes, and filled with miserable Two-Hearts making very slow and painful progress. On the left was the fine, smooth highway with no person in sight, since everyone had sped along so swiftly. I took it, passed many ruins and deserted houses, reached the mountain, entered a narrow valley, and crossed through the gap to the other side. Soon I came to a great canyon where my journey seemed to end; and I stood there on the rim wondering what to do. Peering deep into the canyon, I saw something shiny winding its way like a silver thread on the bottom; and I thought that it must be the Little Colorado River. On the walls across the canyon were the houses of our ancestors with smoke rising from the chimneys and people sitting out on the roofs.26. In this narrative the narrow, dry road filled with cacti and rattlesnakes, where progress is measured by just one step per year, is contrasted with the broad, easy road quickly leading to the canyon of the Little Colorado River. A few miles east of the confluence of this river and the Colorado River is the actual location of the Hopi “Place of Emergence” from the past Third World to the present Fourth World. Physically, it is a large travertine dome in the Grand Canyon to which annual pilgrimages are made in order to gather ritualistic salt. In correlative terms the Milky Way is conceptualized as the “watery road” of the Colorado River at the bottom of the Grand Canyon-- that sacred source to which spirits of the dead return in order to exist in a universe parallel to the pueblo world they once knew. This stellar highway is alternately seen as traversing the evergreen forests of the San Francisco Peaks, upon whose summit is a mythical kiva leading to the Underworld. Talayesva’s account also includes traditional otherworldly motifs such as “the Judgment Seat” on Mount Beautiful, which supports a great red stairway, at least in his vision. (This peak is actually located about eight miles west of Oraibi.) Furthermore, we hear of a confrontation with the Lord of Death, in this case a threatening version of Masau’u (the Hopi equivalent of Osiris), who chases after him. Thus, like the Egyptian journey to the Duat, the Hopi journey to Maski (literally, “House of Death”) has two roads-- one on land and one on water. In this context we must decide whether or not the latter is really a code word for the sky. In the “double-speak” of the astral-terrestrial correlation theory, are these spirits in actuality ascending to the celestial river of the Milky Way? Is this, then, the purpose of the grand Orion schema? --to draw a map on earth which points the way to the stars? Returning to the subject of Orion projected upon the deserts of both Egypt and Arizona, we find both discrepancies and parallels. In terms of distinction the Egyptian plan is on a much smaller scale than the one incorporating the Arizona stellar cities, using tens of kilometers rather than hundreds of miles. Furthermore, the bright stars of Betelgeuse and Rigel are perplexingly unaccounted for in the Egyptian schema. (Recently two independent Egyptologists, Larry Dean Hunter and Michael Arbuthnot, claimed to have found all the stars of Orion represented by constructions on the Egyptian landscape. However, their terrestrial correlations are somewhat different than those originally put forth by Bauval and Gilbert. See “The Orion Pyramid Theory” in the Research/Articles section of the Team Atlantis web site.) In addition, from head to foot the Giza terrestrial Orion is oriented southeast to northwest, while the Arizona Orion is oriented southwest to northeast. Of course, the pyramids are located west of the Nile River, while the Hopi Mesas are located east of the Nile of Arizona,27. i.e., the Colorado River. We should also point out that Abusir is not in the correct location to match Orion’s head on the constellatory template. Bauval and Gilbert state that Abusir is ...a kilometre or so south-east of Zawyat Al Aryan.28. (Bellatrix, or Orions left shoulder); it is in fact about six kilometers southeast. In other words, Abusir is nearly four miles south-southeast of where it should be according to the Star Correlation Theory. Unlike Bauval, Gilbert, and Hancock, the present author has not yet traveled to Egypt, but the consultation of any scale map will verify this statement.29. Despite these few differences, the basic orientation of the Egyptian Orion is similar to that of the Arizona Orion, i.e., south, the reverse of the celestial Orion. According to Dr. E.C. Krupp, Director of the Griffith Observatory, this is one of the factors that invalidates the Orion Correlation Theory.30. This critique, however, is the result of a specific cultural bias in which an observer is looking down upon a map with north at the top and south at the bottom. Imagine instead that the observer is standing on top of the Great Pyramid (or for that matter, at the southern tip of First Mesa) and gazing southward just after midnight on the winter solstice. The other two pyramids (or Mesas) would be stretching off to the southwest in a pattern that reflects the Belt of Orion now achieving culmination in the southern sky. We can further imagine that if the upper portion of the terrestrial Orion were simply lifted perpendicular to the apparent plane of the earth while his feet were still planted in the same position (Abu Ruwash and an undetermined site in the case of Egypt; Canyon de Chelly and Betatakin in the case of Arizona), then this positioning would perfectly mirror Orion as we see him in the sky. When the Anasazi gazed into the heavens, they were not looking at an extension of the physical world as we perceive it today but were instead witnessing a manifestation of the spirit world. Much like the Egyptian Duat, the Hopi Underworld encompasses the skies as well as the region beneath the surface of the earth. This fact is validated by the dichotomous existence of ancestor spirits who live in the subterranean realm but periodically return to their earthly villages in the form of storm clouds bringing the blessing of rain. Even though the eastern and western domains ruled by Tawa remain constant, the polar directions of north and south, controlled by the Elder and Younger Warrior Twins (sons of the Sun) respectively, are reversed. Thus the right hand holding the nodule club is in the east and the left hand holding the shield is in the west, similar to the star chart. However, the head is pointed roughly southward rather than northward. This inversion is completely consistent with Hopi cosmology because the terrestrial configuration is seen as a reversal of the spirit world, of which the sky is merely another dimension. An alternate explanation for the change of directions is the possibility that the pole shift which destroyed the Hopis Second World reversed the position of the constellation's mundane aspect. Copyright © 2001 by Gary A. David. All rights reserved. Any use of text or photographs without the author's prior consent is expressly forbidden. 1. Grigsby cited in Graham Hancock, Santha Faiia, Heavens Mirror: Quest For the Lost Civilization (New York: Crown Publishers, Inc., 1998), p. 127. 2. J. McKim Malville, Claudia Putnam, Prehistoric Astronomy in the Southwest (Boulder Colorado: Johnson Books, 1993, 1989), p. 23. 3. Inhabited from A.D. 1026 (or possibly earlier in light of the underlying pit house) through 1300, Kings Ruin has a thirteen room foundation, twelve of which could have been two stories high. The five hundred pieces of unworked shells found at the site indicate substantial trade with the Pacific. Necklaces of turquoise, black shale and argillite were also found, one of the former material consisting of 2,031 beads that stretched sixty-six inches long. Fifty-five graves were also discovered, containing sixty-six individuals, most of which were buried in the extended posture with heads oriented toward the east, awaiting Pahanas return. Ginger Johnson, A View of Prehistory in the Prescott Region (Prescott, Arizona: privately published,1995) pp. 8-9. 4. Occupied for a few generations after A.D. 1088, abandoned and then reoccupied between 1225 and the late 1200s, Salmon Ruin near the San Juan River contained from between 600 and 750 rooms. It also had a tower kiva built on a platform twenty feet high which was made of rock imported from thirty miles away. Ten miles north of Salmon is Aztec Ruin (an obvious misnomer) located on the Animas River. At its peak development it contained about 500 rooms. Like the former, this latter site was originally inhabited in the early twelfth century by people of Chaco Canyon and then re-inhabited from 1225 to 1300 by people of Mesa Verde. In addition, it has a restored Great Kiva. 5. Inhabited from A.D. 1226-1276, Wide Ruin, or Kin Tiel, about fifty miles due south of Canyon de Chelly, is an oval shaped pueblo of 150 to 200 rooms with a number of kivas. Atsinna pueblo, located atop a high mesa at El Morro National Monument, was a mid-thirteenth century rectangular structure, part of which was three stories in height. It had 500-1000 rooms and two kivas, one circular and the other square. --b. Norman T Oppelt, Guide to Prehistoric Ruins of the Southwest (Boulder, Colorado: Pruett Publishing Company, 1989, reprint 1981). 6. Constructed in the mid-eleventh century, Casamero Ruin was a small thirty room pueblo. However, its Great Kiva, one of the largest in the Southwest, was seventy feet in diameter-- even slightly more spacious than the better known Casa Rinconada at Chaco Canyon about forty-five miles to the north. Noble, Ancient Ruins, pp. 89-90; and Oppelt, Guide To Prehistoric Ruins, p. 177. 7. Robert H. Lister and Florence C. Lister, Those Who Came Before: Southwestern Archeology in the National Park System (Tucson, Arizona: Southwestern Parks & Monuments Association, 1994, reprint 1993), p. 224. 8. Located in the Mogollon Mountains of west-central New Mexico, Gila Cliff Dwellings National Monument is a ruin comprised of forty rooms in five separate caves located 150 feet above the canyon floor. The timbers of these structures have been tree-ring dated in the 1280s. The late Mogollon, or Mimbres, people are known for their exquisite black on white pottery, using realistic though stylized designs. The site was abandoned by 1400. Noble, Ancient Ruins, pp. 7-8. 10. Located nearly ninety miles southeast of Homolovi and about twelve miles north of the Casa Malpais, the Raven Site (privately owned by the White Mountain Archeological Center) was occupied as early as A.D. 800 through A.D. 1450 and had more than eight hundred rooms and two kivas. James R. Cunkle, Raven Site Ruin: Interpretive Guide (St. Johns, Arizona: White Mountain Archaeological Center, no publication date). 11. Jefferson Reid and Stephanie Whittlesey, The Archaeology of Ancient Arizona (Tucson, Arizona: The University of Arizona Press, 1997), p. 220. 12. Occupied from A.D. 1085-1207, Ridge Ruin was a thirty room pueblo with three kivas and a Maya-style ball court. It was also the site of the so-called Magicians Burial. Thought by Hopi elders to be of the Motswimi, or Warrior society, this apparently important man was interred with twenty-five whole pottery vessels and over six hundred other artifacts,including shell and stone jewelry, turquoise mosaics, woven baskets, wooden wands, arrow points, and a bead cap. --a. Rose Houk, Sinagua: Prehistoric Cultures of the Southwest (Tucson, Arizona: Southwest Parks & Monuments Association, 1992), p. 7. --b. Oppelt, Guide to Prehistoric Ruins, pp. 99-100. --c. Reid and Whittlesey, Archaeology of Ancient Arizona, pp. 219-220. 13. The eponymous Winona Village, which was occupied at the end of the 11th century, contained about twenty pit houses and five surface storage rooms. Oppelt, Guide To Prehistoric Ruins, p. 99. 14. The Emilienne Ruin had a foundation of twelve rooms, most of which could have been two stories high, plus eleven outlying one-room units. 15. The Fitzmaurice Ruin, occupied from A.D. 1140-1300, had twenty seven rooms in which were found beads, pendants, bracelets, and eighty one amulets, including crystals, animal fetishes, obsidian nodules (so-called Apache Tears) and a curious six-faceted, truncated pyramid carved from jadeite and measuring 1.5 centimeters wide. --a. Franklin Barnett, Excavation of Main Pueblo At Fitzmaurice Ruin: Prescott Culture in Yavapai County, Arizona (Flagstaff, Arizona: Museum of Northern Arizona, 1974), p. 95. --b. Johnson, Prehistory in the Prescott Region, p. 16. 16. Similar to the Nazca lines of Peru, these intaglios of human, animal, and star figures, some over a hundred of feet long, were made by removal of the darker, desert varnished pebbles, exposing the lighter soil beneath. Reid and Whittlesey, Archaeology of Ancient Arizona, pp. 127-129. --According to the Mohave and Quechan tribes of the lower Colorado River region, the human figures represent the deity Mastamho, the Creator of the Earth and all life. Notice the similarity between the name of this god and that of the Hopi earth god Masauu. These figures are thought to be between 450 and 2000 years old. 17. Also at 1:15 a.m. on this date Bellatrix is at 240 degrees azimuth and Meissa is at 242 degrees azimuth. Forty minutes later Alnilam is at 240 degrees, the azimuthal degree at which the sun will set on this same day at 5:15 p.m. Incidentally, at this winter solstice sunset time Orion is just rising on the opposite horizon, thus emphasizing the pivotal relationship of Orion/Masauu and the Sun/Tawa. All astronomical computations performed with Skyglobe. Mark A. Haney, Skyglobe 2.04 for Windows [floppy disk] (Ann Arbor, Michigan: KlassM Software, 1997). 18. Edmund Nequatewea cited by John D. Loftin, Religion and Hopi Life In the Twentieth Century (Bloomington, Indiana:Indiana University Press, 1994, reprint 1991), p. 33. 20. Richard Maitland Bradfield, An Interpretation of Hopi Culture (Derby, England: published by author, 1995), pp. 134-135. University of Oklahoma Press, 1989, reprint 1984), pp. 79-82. 22. Waters and Fredericks, Book of the Hopi, pp. 161-162. 23. Robert Bauval and Adrian Gilbert, The Orion Mystery: Unlocking the Secrets of the Pyramids (New York: Crown Publishers, Inc., 1994), p. 125 ff. 24. Adrian Gilbert, Signs in the Sky (London: Bantam Press, 2000), p. 65. 25. Graham Hancock and Robert Bauval, The Message of the Sphinx: A Quest For the Hidden Legacy of Mankind (New York: Three Rivers Press, 1996), p. 175. --The discussion by Bauval, Gilbert, and Hancock of the Egyptian master plan is a great deal more complex than what is merely sketched out in this article. Their opus involves various facets such as precession of the equinoxes, star-targeted shafts in the Great Pyramid, and other topics which are not directly relevant to our discussion. However, this compelling work overall has challenged many orthodox ideas in Egyptology and has spawned heated debates both on the amateur and the professional levels. 26. Don Talayesva, Leo W. Simmons, editor, Sun Chief: An Autobiography of a Hopi Indian (New Haven: Yale University Press, 1974, 1942) pp. 121-128. 27. Reid and Whittlesey, The Archaeology of Ancient Arizona, p. 112. 28. Bauval and Gilbert, The Orion Mystery, p. 139. 29. T.G.H. James, Ancient Egypt: The Land and Its Legacy (Austin: University of Texas Press, 1989, 1988), p. 41. 30. E.C. Krupp, Skywatchers, Shamans, & Kings: Astronomy and the Archaeology of Power (New York: John Wiley & Sons, Inc.), pp. 290-291.